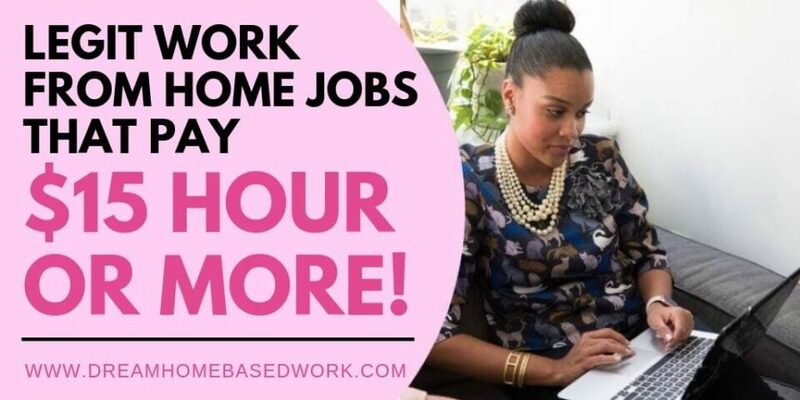 Home » Latest from the Blog » Work from Home » Best Paying Jobs » 10 Legit Work from Home Jobs Paying $15 Per Hour or More! To be honest, the majority of work at home jobs offered by different companies usually provide a starting pay of around $8 per hour or slightly lower. That can sometimes be insulting to most people, including me! It is therefore considered good luck when you come across those that pay much higher and you can do the required tasks comfortably. I have done some research to find companies that pay their home-based workers $15 or more per hour. If it seems like this list doesn’t have anything you would prefer, check out more high-paying jobs at FlexJobs.com or this list of work at home jobs that pay $20 per hour or more! Please subscribe for follow us on YouTube and Facebook. I offer lots of work from home jobs, leads and weekly video tutorials. The Social Element, formerly known as EModeration, hires Online Moderators to work from home. As a Moderator, your role will be to effectively manage the profiles as well as social media pages of clients. The management can stretch into forums and even discussions that mention clients in one way or another on online platforms. To do well in this work at home position, you need to enjoy interacting with people on social media and understand how a number of them work, at least the major ones such as Facebook, Twitter, Instagram, Pinterest, and YouTube, among others. The online moderating jobs are open to local and international job seekers and can be according to your schedule. The starting pay is $15 per hour. To apply go here. VIP Kid hires part-time tutors to teach the English language to Chinese kids. Tutors can make up to $2000 per month equivalent to $18 per hour. A bachelor's degree in any subject is required. Click here to apply now. Worldwide 101 hire Virtual Assistants in 17 states to work for them as employees. As an assistant, you are responsible for handling administrative tasks and clerical work, among other things. To work for them you will need a working computer with updated anti-virus software, reliable internet, headset and a website camera. The jobs on this site are open to everyone, hence the name worldwide in the company’s name. Workers earn $20-$22 per hour and the company requires at least 7+ years of experience. The application and hiring process includes 3 video interviews. Payment for assistant tasks done well is via PayPal and on a monthly basis. Go here to apply. Hawo is an online tutoring company with work at home openings ESL teachers in the US and Canada. A bachelor's degree is required in any field. The starting pay is $18 per hour plus bonuses for each 45-minutes session. Brighten Communications hires Telemarketers as independent contractors to work from home in the US. You will need a landline phone and strong internet access. Workers earn up to $18 per hour along with a flexible schedule. Aira hires work at home agents to help assist blind people with reading tasks. The company pays $15 per hour. Training provided. Apply here! Stitch Fix offers the ideal work at home job for fashion stylists that have a creative eye. The stylists who are hired from particular areas in the country act as personal stylists to customers on the site. Your role is to select a number of items from a customer’s fashion box and send it over to their shipping address. If the customer likes your selection, they purchase them, resulting in a sale for you. To get hired you need to be 18 and over and be ready to attend offsite training before starting the job. All the stylist positions offered by the company are paid $15 on an hourly basis but can go higher depending on the position held by the company. Sometimes it can take a while to land a transcription job, so I suggest signing up with Swagbucks.com and Cashcrate.com to start earning money right away. To apply go here with Stitch Fix. Working from Home as a Virtual Customer Services Agents for American Express is a great way to earn money online. The position offers a starting pay rate of $16 per hour, requires you to handle customer related inquiries for the company as a full-time employee. They offer benefits apart from the pay which is attached to the forty hours that you have to work every week. To be hired at American Express, you must have a bachelor's degree or at least four years of experience in a similar position. In addition, you will need a dedicated phone line, stable internet service, of which they cover the cost and an office space that is very quiet with no noise in the background. Go here to apply. If you need additional info about the company (schedule, pay, job requirements, etc. ), go here. Byron offers openings to those interested in becoming a Virtual Assistant. (The application process is open to residents of the United States). To work for this company you will need at least 3 years of experience working as an executive assistant or Virtual Assistant. When hired at Byron expect a starting pay of $12-$15 per hour, which can go higher depending on your experience. If you’re looking for more jobs like this one, check out this list of all kinds of companies that hires Virtual Assistants. Chegg hires Online Tutors to work with home tutoring students online in different school subjects. They also assist students with their homework and relevant studies so that they can understand the content better and eventually pass their tests. Tutoring sessions can take place through Skype, video chat, text messaging and even a whiteboard depending on your preference and that of the students you tutor. Payment to tutors on Chegg is $20 for every hour through PayPal, which is deposited weekly on Fridays. To apply, go here. Enjoyed this Post? Be a Pinterest Helper and Pin This Photo! 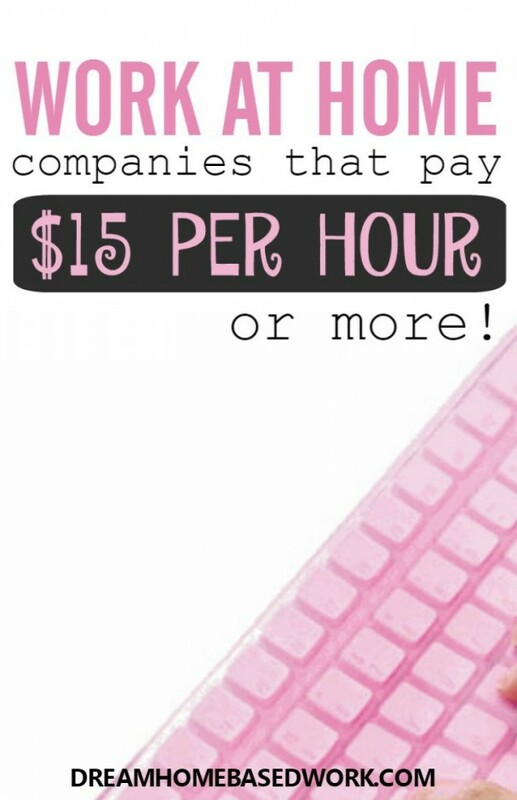 Looking for More Companies That Pay $15 Per Hour or More? Visit FlexJobs.com, a company that has been rated A+ with the Better Business Bureau. They offer money-back guarantee to candidates who aren’t satisfied with their website’s service. FlexJobs assures that every job posted on their site is 100% legit. I work for Appen Butler, and I absolutely love working for them, but they do not pay $15.00 per hour. They pay anywhere from $9.00 to $13.75 per hour. Hi Lashay, I live in Spanaway Washington I am looking for a work from home job that pays 11 dollars or more with possibly benefits would be nice. I have applied for a few of them and I am currently on with a Rate Position with Leapforce. I have a new computer, headset, and everything I need for at home Appointment setter or Call Center Associate. If you know of any please let me know. Thank you and have a great day!! I am from India and i want to work from Home can you suggest some companies with which i can get in touch with. I am interested in data entry, Chat jobs, and transcription jobs. Hi Lashay. Thank you for the useful Websites. I have been working from home for about a year now as a Survey taker. I was wondering since you have years of experience, do you know of any writing or clerical Websites that pay at least 11 or 12 dollars an hour? And that pay a week to biweekly a large sum of money via Paypal?